A developer, a school district trustee, and the head of a housing nonprofit discuss one of the city's most pressing issues. As Dallas’ glossy skyline lit up the night a few miles away, a panel discussion earlier this week in Oak Cliff addressed the specter of the city’s growing housing crisis. The panel, which was organized by the Texas Tribune, explored many of the foundational reasons that the city is undergoing a housing crisis amid its gilded development spree—generational poverty, a lack of housing affordability, transportation, systemic racism. Moderated by Brandon Formby, the panel, held at Jefferson Ave.’s Mercado 369, included Monte Anderson, a developer known for his work in southern Dallas; Christie Myers, the managing director for the housing-focused nonprofit Opportunity Dallas; and Dallas ISD trustee Miguel Solis, who has led the charge in getting the district to correlate the impact of housing upon education. The panelists waded into poverty, stagnant wages, income inequality, the wealth gap, redlining, reliable transit, and access to education—all of which are part of Dallas’ reality. In Dallas, it’s something you can see on the map. Just trace the flow of the Trinity River as it meanders from the northwest to the southeast. Then look at where I-30 slices through the city. The chances afforded to either side of those lines are stark. North is where the affluent, mostly white neighborhoods lie. South and west are lower income and predominantly minority communities. It’s by design. Therefore, while Dallas is growing and thriving to an extent, the lack of affordable housing means that the opportunities the city does provide are only attainable for a few. The city is taking steps to address its problems. Consider its new comprehensive housing policy, which was adopted this year, and opportunity zone investments. These are areas singled out by the state and city that are ranked based on their suitability for investment. There’s also a push to increase density within existing neighborhoods through changes in zoning and the addition of accessory dwelling units. The issue, now, with these changes being deployed, is making sure that they are inclusionary and work to benefit communities. The issues impacting housing and investment are related to many others factors that affect the lives of those who are struggling. They must be seen as intrinsically linked rather than as separate, individual matters, the panel agreed. One of the biggest factors that led to the current housing crisis in Dallas were past policies instituted at every level of government. Since the end of World War II—and before in some cases—programs were put in place to disenfranchise residents of color. This was done through zoning, redlining, and deed restrictions to deny those communities the privileges white communities enjoyed. The intentional segregating came with harsher economic burdens that are still present. The city faces a daunting challenge to raise the standard of living for its residents and provide them with affordable housing. But, according to the panelists, there are ways in which it can be achieved. For Anderson, it means creating entrepreneurs and wealth rather than simply jobs and renters. This can be done through education, incentives and cheap loans for people in southern Dallas, as well as land banks that cater to poorer residents who are looking to buy a home, he proposed. Myers said that new development should actively seek to not displace those already living in an area, especially in ones marked as high opportunity, because of the potential benefits to those residents. Forcing people out only enhances the poor practices of the past and furthers the negative impacts that gentrification can have. She also insists that access to reliable and efficient mass transit be improved. As for Solis, it’s a matter of integration—not just in the communities but in government agencies. Only then can the systemic decisions that led to persistent and rampant discrimination be dismantled. What have you had to sacrifice to afford to live where you live? What, if anything, have you tried to address this issue? What can be done by your state and/or local government to address these issues and move toward and affordable housing solution? Answers varied. Group members went around the table and talked about each issue. Debra Freeman, who lives in Lewisville, spoke about a neighbor, who is a single mother, whose car broke down which prevented her from getting to work. Freeman loaned her one of her cars for a month to help because the mother could not afford to pay for her repairs right away because of her rent and day care costs. Becky Lewis, who is running for City Council in District 4, spoke about the poverty and lack of opportunity she sees in her community and how it led to her getting involved more in her community. All at the table agreed that stagnant income played a major role in creating the conditions that they saw and experienced. Matters of healthcare, homelessness, the minimum wage, and the role of employers were also discussed. 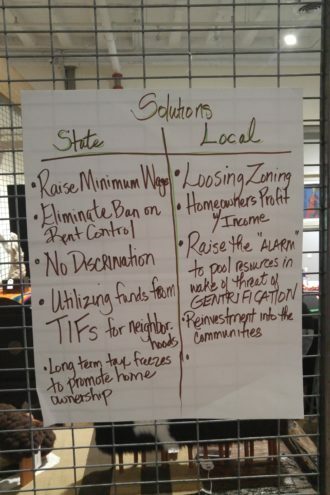 Groups then were asked to come up with potential ideas for local and state government to spur the creation of more affordable housing, which were presented at the end of the night.